Vegetable soup is one of those recipes, like chili, where isn’t really a recipe. There are so many different versions and styles, you can try a 1,000 versions without any repeats. In fact, frequently “clean out the fridge” day at my house frequently results in a pot of vegetable soup on the stove, because I’ll make it with just about anything I find. 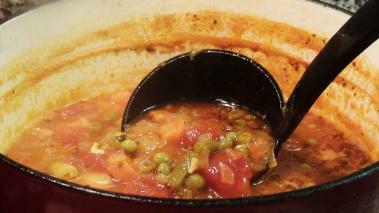 In this recipe, I show you a pretty basic version of vegetable soup, that not only tastes great, but is super healthy too. Along with a salad and/or some good crusty bread, this soup makes a great (and fast if you freeze the leftovers) dinner, that you’ll feel good eating. Give it a try, let me know how it goes, and I hope you enjoy it as much as I do. As I said, vegetable soup recipes are as much about techniques as they are about ingredients. Pay attention to these few things and yours will turn out great. Season. The biggest issue if the soup tastes flat, is likely salt and pepper. So make sure to season in the beginning, taste as you go, and adjust as needed. Serve it (I love the soup served simply with bread and butter) and enjoy! Wine Recommendation with Vegetable Soup: I think this vegetable soup, with its fairly rich tomato base, matches will with red wines. I’d suggest you go either with a Chianti, which is notoriously good with tomato, or with a spicy/musty pinot noir (avoid a fruit forward style which would be lost in the rich vegetable broth).